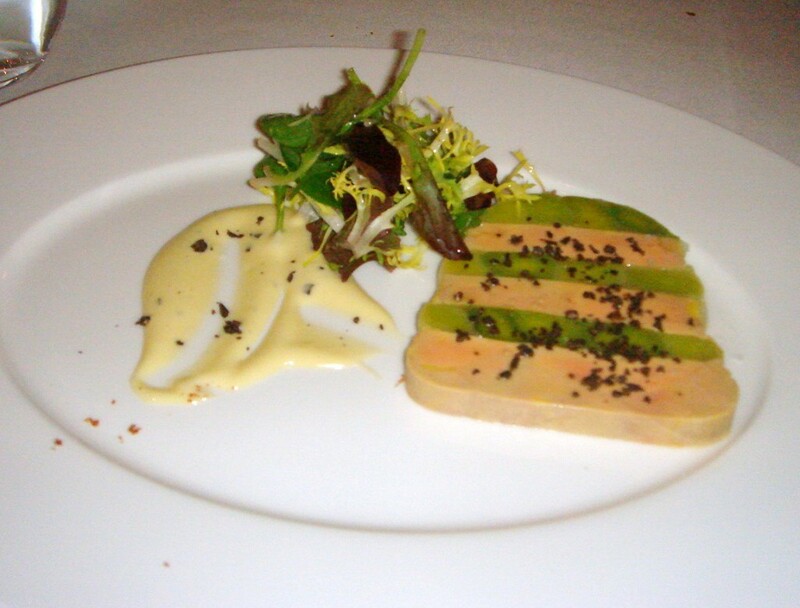 A terrine of Landaise foie gras and leeks, truffle vinaigrette (£12.50) was less impressive. It was difficult to fault the execution of the individual components of the terrine. The foie gras was velvety smooth, and the leeks were tender and sweet. But with the use of the cheaper leeks making up half the terrine, I somehow couldn’t help think that this was a bit of a ‘cheat’ dish. The leek also drowned out some of the flavour of the foie gras when both were eaten together. Therefore the terrine would have fared better with no leek, which would have allowed the flavour of the foie gras to sing out on its own. This starter came with a little side salad which was very fresh, but it was hard to taste the truffle in the vinaigrette. The accompanying brioche was nicely toasted with a soft centre. 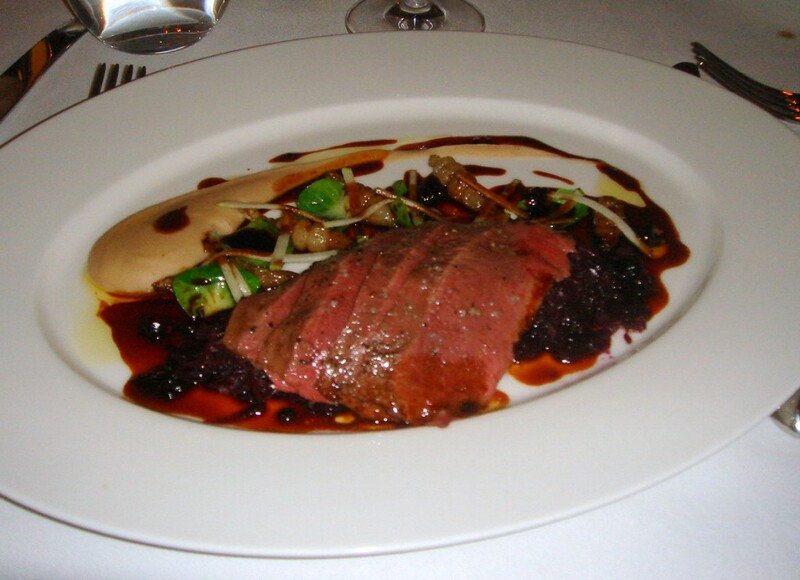 Saddle of Denham Estate venison, red cabbage and blackcurrant sauce (£22.50) yielded bags of flavour. The venison was juicy and tender and worked well with the wonderfully spiced red cabbage and the nicely reduced blackcurrant sauce. However there was too much cabbage for the amount of venison on the plate. There was also a chestnut purée, so creamy and decadent that it warmed your soul. An assiette of French veal (£21.50) (from left to right in the picture: braised cheeks, caramelised sweetbreads, brains fried in flour and belly slow cooked in Armagnac) were all well cooked and provided a contrasting mix of flavours. The sweetbreads and brains were particularly pleasing with their lightness of texture and rich meaty taste. The only slightly disappointing aspect of this dish was that both the accompanying carrot and cumin purée and the sauce diable were over seasoned. Our first dessert was a generous (huge in fact) piece of apple tarte tatin with crème fraîche (£9) (which was surprisingly served on a cold plate). The puff pastry, being light, buttery and flaky, was delicious. 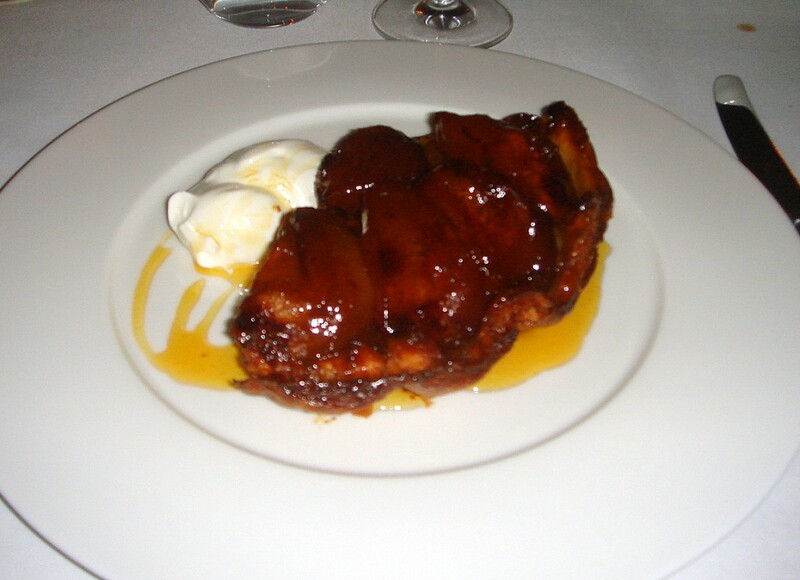 The apples were soft and fragrant and the accompanying caramel sauce was too sweet, and had the effect of overwhelming the palate after a few bites. 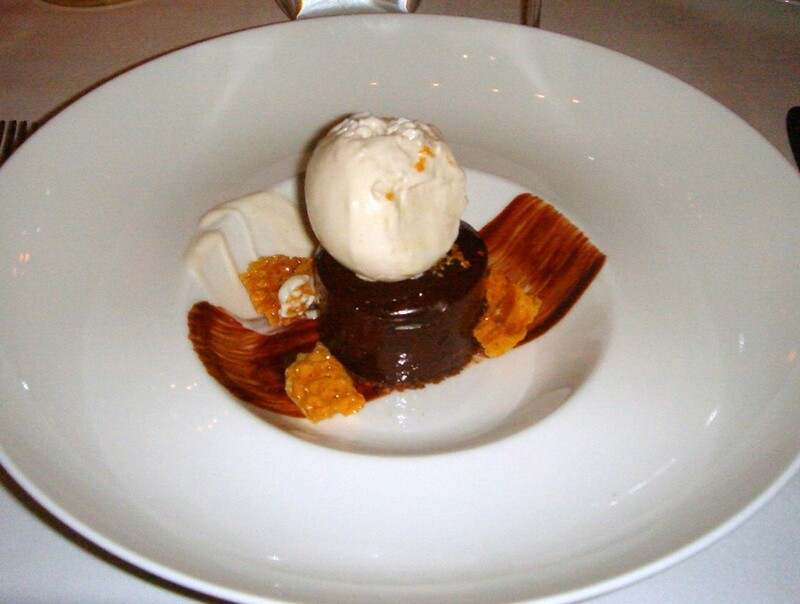 A chilled chocolate fondant (£8.50) was a classic rendition of a warm fondant – a rich, dark chocolate pudding with a soft core and a firm casing. However, being chilled, the centre was not as runny as it would be in the warm version. I had no complaints about the execution of this fondant, but on balance, warm fondants are simply more tantalising as they ooze more luscious goodness. The fondant was served with some lovely banana yoghurt ice cream and honeycomb. Overall service was very good and polished, except that our water took too long to be delivered. Our waiter also got a bit confused about what was in the veal dish when he tried to explain it to us, but he was very pleasant and friendly nonetheless. Apart from a few minor quibbles, the food was executed with flair and skill to produce delicious platefuls of enjoyment. I’ve always liked the food at Galvin Bistrot de luxe on Baker Street, and I’ve also been in awe of the impressive design of the bar at Galvin at Windows. And with this new restaurant, the Galvin brothers (kudos to them) have again managed to combine both wonderful design and food for their latest reincarnation. This is an ‘occasion’ restaurant, and it’s worth it. Note that there is also a cheaper eatery located around the corner from Galvin La Chapelle called Café de Luxe. It has a cheaper and simpler menu. Price range: 3 courses from £27 to £46. Excludes drinks and service. I really loved reading your write up on this place. I must be one of the few to have been underwhelmed by the room (I think Galvin at Windows has much more of a jaw to floor effect) but I think I went in with super high expectations given all that has been said of the architecture. 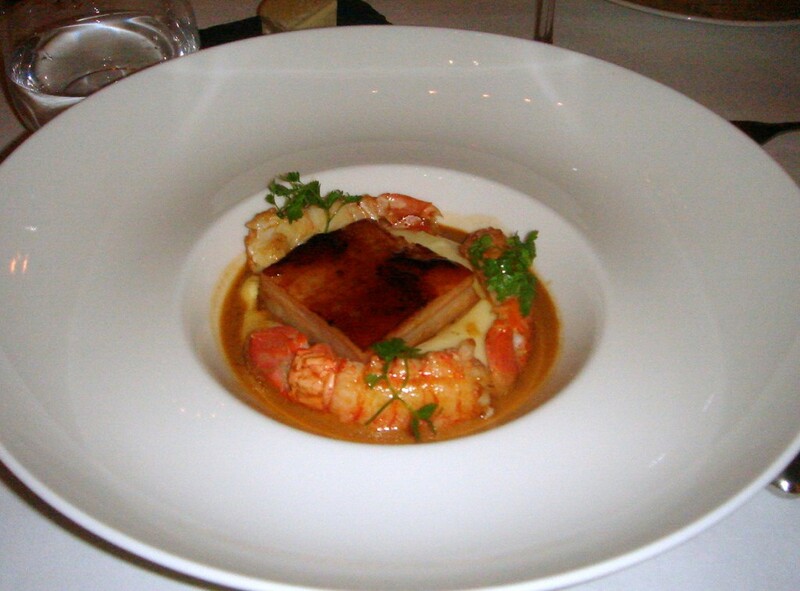 However, the food soon won me over – beautifully executed, as ever from the Galvins. That pork belly dish looks absolutely delicious. Holy baby cow brains, Batman!! I’ve never had it before but sounds like a worthy thing to try, albeit in small portions haha. The venison and pork belly dishes look simply stunning. Thanks for the very interesting review. Am due to try it soon, so am quite excited. Great review, the niggles being included does help to give a fair impression of the food, I think! I hope to visit soon! Sounds and looks very decadent. 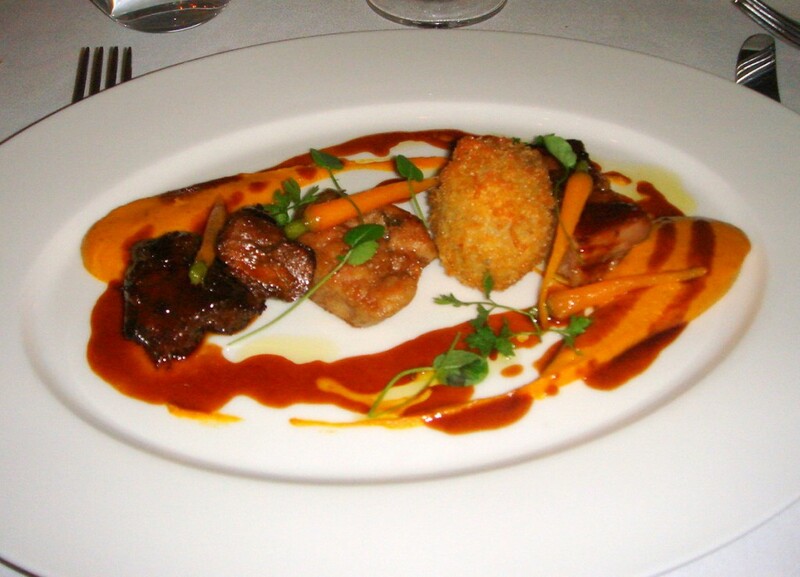 Particularly like the idea of the assiette of veal – especially the cheeks.